It may not be something that everyone looks forward to, but your overall health actually depends on a good teeth cleaning every six months. In around half an hour, our dental hygienists will examine the condition and health of your gums, ensure that all of the plaque and tartar is removed from your teeth, give them a thorough brushing, and protect your teeth from cavities until your next cleaning. In just a small amount of time, you can have peace of mind knowing that your teeth are healthy and protected. But why are teeth cleanings so important? Plaque is a white film that develops on the enamel of your teeth and around your gum line. Even though brushing and flossing can help remove some of the plaque that builds up, the only way to remove all of the plaque, especially in hard to reach areas, is with a regular teeth cleaning. If the plaque is not removed, it will start to eat away at the enamel and eventually cause tooth decay. As for cavities, they’re also formed as enamel is lost and the tooth begins to decay. Again, brushing and flossing can play a big part in protecting your teeth, but it’s essential that you protect your teeth with regular cleanings. Visit us in our Seattle office for a cleaning. And if you do have any cavities, we can help with tooth fillings as well. The longer you wait for a teeth cleaning, the more plaque that is constantly building up on your teeth. The longer this material sits on your teeth, your risk of gum disease and tooth loss increases. If gum disease develops, it can progress into the gums and surface of the tooth. If this goes unchecked, it can cause serious tooth loss. Everyone wants a bright and shiny smile, right? Well, every day there are things that prevent this from happening. Your morning coffee, the soft drink at lunch, or the glass of red wine at dinner are causing stains to develop on your teeth. To ensure these stains don’t become worse, visit First Hill for a thorough teeth cleaning. 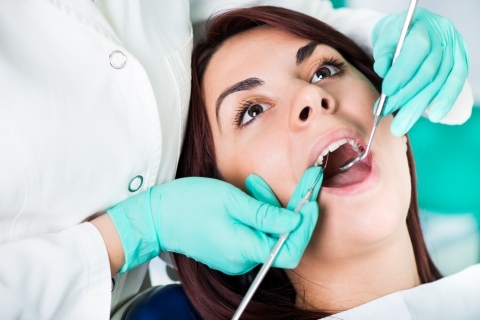 It may be surprising, but your dentist can actually help maintain your overall health. If you skip brushing your teeth and flossing every day, this can lead to mouth cancer, heart disease, and even diabetes. When you visit a dentist, they can help prevent these problems in the first place, or detect them early enough for them to be treated. So when it comes time to schedule a cleaning with your dentist, try not to put it off for too long. Your teeth will thank you! Schedule an appointment with First Hill Dental in downtown Seattle today for a regular checkup. We’ll make sure your entire mouth is healthy and protected from plaque, cavities, and tooth decay. We understand that going to the dentist isn’t everyone’s favorite thing to do, but we can assure you that we’ll make the cleaning as comfortable as possible. Call us today!